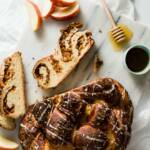 Learn to make an extra special challah for Rosh Hashana or any time you want a treat. 1/4 teaspoon sea salt Any salt that isn't finely ground will work for this. Whisk together flour, salt, and yeast in the bowl of a stand mixer. Add honey, vanilla extract, eggs, egg yolks, vegetable oil, and water. Place the bowl on the stand mixer fitted with dough hook. Mix on low for 30 seconds and gradually increase to high speed. Continue to mix for about 2 minutes or until the dough starts to come together. Remove from the mixing bowl and turn out to a surface covered with a little oil. Form the dough into a ball. Place in a loosely covered bowl (I suggest covering with lightly oiled plastic wrap) and set out to rise for about two hours or until roughly doubled in size. Place all ingredients into a food processor and process until the apples are in approximately 1/4 inch pieces. Divide the dough into four even pieces. Roll a piece of dough out to approximately 12 inches by 4 1/2 inches. Spread 1/4 of the apple filling onto the dough, leaving a small border around the edge. Roll the dough tightly around the filling, forming a log. Repeat with the other three dough pieces. Follow the step-by-step photos in this post to braid the dough into a round loaf. Set in a warm place to rise for 90 minutes. In a small pot, bring water and baking soda to a boil. Remove from heat and set on the counter until it's cool enough to touch. Generously brush the liquid over the top of the challah, making sure to get into the crevices. Sprinkle sea salt over the dough. Bake for 40 minutes or until the top is golden and you can see some light browning in the folds of the bread. Set on a cooling rack to cool. Mix ingredients in a small bowl. Add more powdered sugar or juice as needed to create a glaze that will drip slowly off of a spoon.